Stability – pigments need to have good colorfastness so that the paint holds up and does not fade over time. Dyes typically do not have good colorfastness which is why pigments are used as much as possible. Brightness – chosen pigments need to be bright to provide the best color. These and other ingredients need to dry to a glossy finish for the best appearance. Pigment Size – generally smaller is better because smaller pigment particles have better transparency and provide better color. Plus, being able to use not as much pigment with a smaller particle size means a less expensive formulation. Viscosity – paint needs to have an even thickness and lower viscosity is better for particle distribution during dispersion. The Dispermat SL model line is the current horizontal bead mill system. 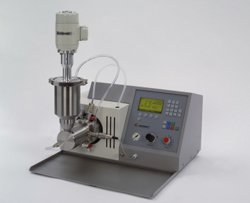 Milling chamber sizes can start at 50 ml to save on raw material costs. High speed bead mills have become popular because they can process solid materials that are difficult to disperse and can achieve a level of fineness that is often hard to get with a dissolver. The overall dispersion process is still the same, consisting of three phases: wetting, mechanical dispersion and stabilization. The part that differs with a bead mill is how the mechanical breakdown takes place. 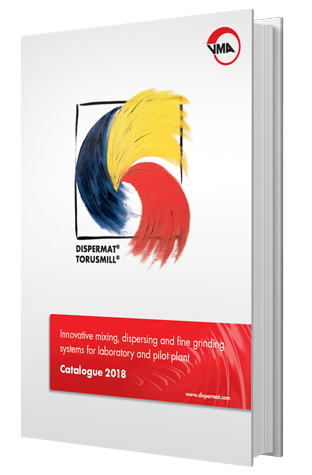 There are two methods that can be used with DISPERMAT® SL bead mills. If using the single pass method, the liquid is collected after it is fed through the bead mill. This is often enough for easily dispersed pigments. The recirculation method is where the fluid is fed back into the bead mill for further processing from an opening just outside the milling chamber. This process is used for more difficult pigments and multiple passes through the chamber ensure that all agglomerates are dispersed equally, making this a very efficient technique. When looking to optimize dispersion, time and energy are the key components to look at first. If the dispersed liquid is not at the desired level, increasing time and/or mechanical power input with a faster speed usually resolve the issue. Another thing to consider is using smaller or harder beads. The bead mill operates most economically with as much solid material as possible. If there is flocculation after dispersion, the proper additive may help (see “Additives”) and examining the millbase formulation is another possibility. 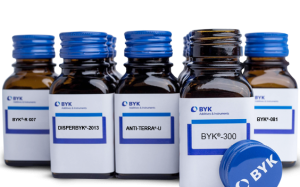 There are many additives available that can assist in some dispersion stages. However, it must be emphasized that additives cannot take the place of proper grinding and mechanical dispersion of pigments (second stage). Specifically, additives can help in the first (wetting) and last (stabilization) stages of the dispersion process. Wetting additives hasten the wetting of particle agglomerates via the liquid base while dispersion additives help stabilize and prevent flocculation. Wetting additives speed up the penetration of the millbase into the pigment configuration by reducing the contact angle between the binder solution and pigment. They work at the pigment/solution interface which helps integrate the pigment into the base solution faster. Dispersing additives stabilize the final dispersion, so it remains a homogenous solution without flocculation or settling of pigment particles. Flocculation occurs because of particle attraction, therefore an additive works by adding repelling forces between pigment particles. This occurs via electrostatic repulsion and/or steric stabilization. Preventing flocculation is particularly important because it affects several paint qualities. It is also more economical because efficiencies of pigment loading are realized especially when using costly organic pigments. Smaller particle size improves leveling and better color and gloss properties. Depending on the purpose of the pigment, transparency and opacity are enhanced as well. Most coating systems contain more than one pigment and can be a blend of inorganic and organic pigments, which require different wetting and stabilization additives. Once these coatings are dispersed properly, a problem can occur if the system is disturbed and the pigments move away from each other and begin to separate. This is a phenomenon called floating and can cause color changes in the coating system. Pigments have different mobility characteristics and when you put various pigments together in one coating systems, they may not behave similarly which disrupts the homogenous distribution of pigment particles. As solvents evaporate from a layer of coating, it causes small movements which then cause changes in temperature, surface tension and density. Pigments are part of these movements, but different mobilities can mean pigment separation. There are controlled flocculating additives for this issue but even a controlled flocculation is of concern where color and gloss properties are of high value, such as a high value topcoat system. The use of polymeric wetting and dispersing additives provides the best solution. They equalize the mobility across pigments yet provide deflocculation as well. The pigment particles become firmly incorporated into the binder solution with reduced mobility.